(Youngstown, NY)- The Youngstown YC will be again hosting one of the most enjoyable regattas in western Lake Ontario. The fun and games include an “impromptu” (but, very serious) hockey game along the waterfront parking lot between Canadian and American sailing teams; bragging rights for North American supremacy in this department has flipped back and forth over time. Nevertheless, the sailing offshore just east of the famous Niagara Falls is every bit as intense and, perhaps even more fun on the water! The event features the J/88 Great Lakes Championship as well as one-design classes for J/22s, J/70s, and a fleet of PHRF handicap racing sailboats. The seven boat J/88 Great Lakes includes an unprecedented three woman skippers leading top teams that could easily sweep the leaderboard, which is how good their performances have been in the past. In no particular order, those woman skippers include Iris Vogel’s DEVIATION, Laura Weyler’s HIJINKS, and Cindy Goodin’s QUIXY. With a half-dozen boats in the J/22 class, the racing will be tight, but watch for the leaderboard to include Mark Sertl’s MONEY FOR NOTHING and Vic Snyder’s MO’MONEY. 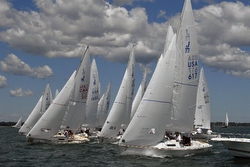 The largest fleet in the event is the dozen boats sailing the J/70 class. For sure the leading crews include the famous Travis Odenbach leading his USA 40 crew as well as Tod Sackett’s FM. There will be four Canadians taking on the Americans, hoping to bring on an upset of epic proportions; such as Rick Veale’s EL JEFE, Rich Jones’ MAVERICK, and Mark Wolff’s JAM. 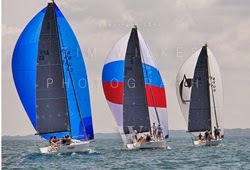 In the world of PHRF handicap racing, the PHRF Spinnaker division includes two of those potent PHRF weapons- the J/35s CRIME SCENE (Paul Angus Bark) and LOYALIST (Andrew Koolman). They will be joined by the J/124 FUTURES (John Reinhold), the J/80 LIFTED (Ed Berkhout), and the J/24 SQUIRMY (Alex O’Brien). In addition, the PHRF Non-Spinnaker division includes the J/35C ROGUE WAVE (Doug Clarke) and the J/34 SOUND WAVE (Fred White). For more J/88 Great Lakes and CanAm Regatta sailing information Add to Flipboard Magazine.